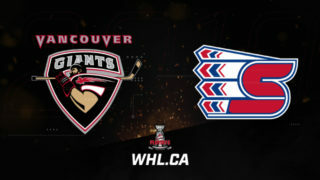 Tonight the Vancouver Giants kick off their home February schedule when they take to the LEC ice against their B.C. Division rivals, the Prince George Cougars. 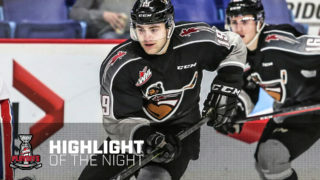 The Giants are looking to avenge a 3-0 road loss last night in Portland while the Cougars are also coming off a road loss – A 4-1 decision last night in Kamloops. Tonight’s game marks the sixth meeting of the season between these two foes, and the first of what will end up being four games in an eight-day span against each other. 1999-born forward Vladislav Mikhalchuk is enjoying a fine second season in the WHL with the Prince George Cougars. The Belarusian has already surpassed his goal totals from a season ago by four, and his point totals by three. He’s scored a goal in each of the past two games for the Cougars. In five meetings against the Giants, Mikhalchuk has notched two assists. 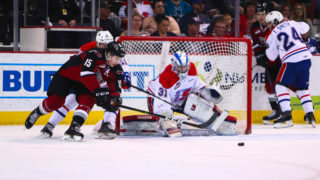 Fresh off a 40 save performance last night in Kamloops, Taylor Gauthier has run into some tough luck as of late for the Prince George Cougars. Despite losing his past six starts, his save percentage in five of those games has been above .900 and a .921-or-better in each of his past four appearances. He’s 0-3 against the Giants this season, but his goals-against-average (2.37) and his .920 save percentage are nothing to sneeze at. Gauthier is ranked #5 among North American goaltenders on NHL Central Scouting’s Mid-Term Rankings for the 2019 NHL Draft. 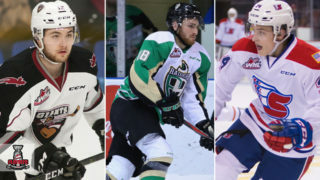 Goals have been hard to come by for the Prince George Cougars this season. Over the course of their eight-game winless streak the Cougars have scored two or fewer goals in each of those games during that span. However in their two victories prior, they scored seven and four goals respectively in a pair of wins over Kelowna. In five meetings against the Giants this season the Cougars have scored two or less goals in each of those games. Through 49 games the Cougars are averaging 2.16 goals-per-game. 2001-born goaltender Trent Miner is 6-1 over the course of his last seven starts and has surrendered two-or-fewer goals against in six of those past seven games. Miner’s goals-against-average since January 6th is 1.57. In two meetings so far this season against Prince George, Miner is 2-0 with a 1.50 goals-against-average and a .956 save percentage. Miner was ranked #6 among North American goaltenders on NHL Central Scouting’s Mid-Term Rankings List. 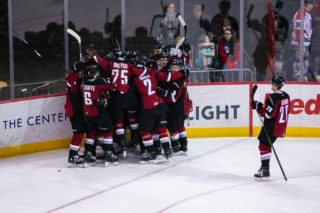 The Vancouver Giants have had an incredibly difficult time generating power plays over the course of their past eight games. In four of their past eight games the Giants have managed to secure only one power play. During that span the Giants have gone just two-for-19. The Cougars come into action tonight with the sixth most penalty minutes in the WHL. Will that help turn the tide on the Giants lack of power plays as of late? Defenceman Nic Draffin will make his WHL regular season debut tonight. Tristen Nielsen had a nine-game point streak snapped last night in Portland. Prior to that, he had three goals and 12 assists for 15 points over the course of that span. Brayden Watts (2G, 2A) and Bowen Byram (1G, 3A) lead all Giants in scoring against Prince George this season. Davis Koch has nine goals over the course of the past 10 games. Bowen Byram has 10 goals and nine assists for 19 points over the course of his past 14 games. The next Giants home victory will be their 20th and would match their home victory total from a season ago. The Giants still have eight home games remaining, including tonights tilt with Prince George.